Protesters march for immigrant rights during a Feb. 1 rally in downtown Minneapolis. Photo by Uche Iroegbu. During the dead of winter in 2015, Farah, who only shared his first name for his safety, was on the final leg of a long journey. He had just made the circuitous and dangerous trip from Somalia to the United States, and upon arrival he was officially an undocumented immigrant. Like many young Somalis, he came to the U.S. to seek safety and opportunity elsewhere, and so embarked on the journey that has already taken the lives of over a thousand young men and women in Somalia. Farah took a different route than most, one that isn’t common among Somalis. It all began on a plane to South America and from there he traveled north until he crossed the Mexican-American border, where he found himself in Minneapolis working as a waiter. “The whole trip,” he said with a smile that doesn’t quite reach his eyes, “took three months. I’d arrive at a country without knowing the language and I’d wait for weeks to get word that it’s time to move. I spent those days worried and doubting if I made the right choice.” But Farah’s journey hasn’t yet ended, in fact, this was just the beginning. Numerous undocumented immigrants throughout the state of Minnesota have lived a journey much like Farah’s. But as policies both statewide and nationally grow increasingly more exclusive toward foreign-born residents, the fight to bring drivers’ licenses to the undocumented community has changed. And increasingly, that fight has had a greater impact on immigrants from all over the globe – not just south of the U.S. border. In the Twin Cities, there has been a growing move of counter-organizing against these efforts and protecting immigrants. At the end of the Minnesota Legislature’s 2017 session, Republican lawmakers included a new rule in the public safety omnibus bill that prevents any executive branch officials from enacting new driver’s’ licenses to undocumented immigrants. The rule was added even though undocumented immigrants are already not allowed to receive driver’s licenses in Minnesota. The rule sparked a week of protests at the state capitol, but ultimately Gov. Mark Dayton signed the rule into law – despite attempts to bring Minnesota Republicans back to the negotiating table. 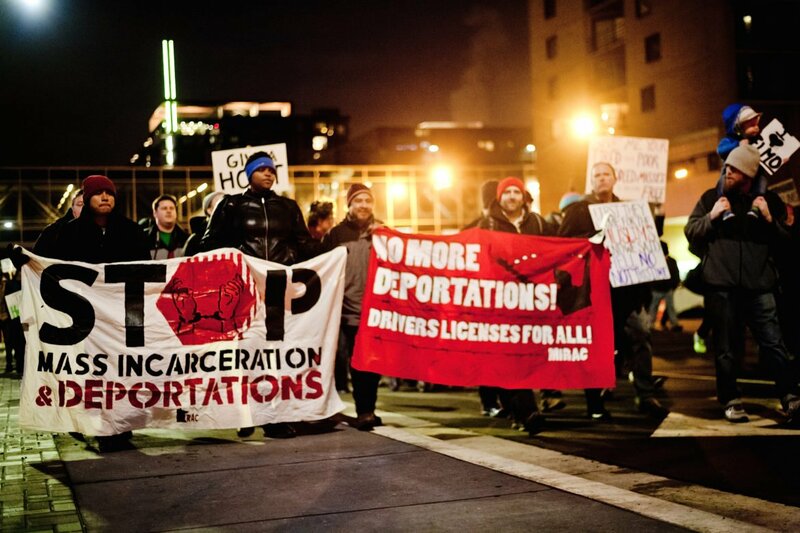 Mariano Espinosa is a community organizer and is also a part of the effort to change Minnesota statewide policy around issuing of driver’s’ license. For him the work is important because it’s about the safety of all Minnesotans regardless of status. “People are driving their kids to the hospital and to school and they have a fear in them that they shouldn’t have,” he said. “Since 9/11, when Immigration and Naturalization Service (INS) changed to Immigration and Customs Enforcement (ICE), they’ve begun to crack down on people of color” shares Mariano. The crackdown he mentions emphasizes the shift of the federal government’s focus services to enforcement. Such a change has had direct impacts on communities of color. According to a 2016 report, the Pew Research Center estimates that the majority of undocumented immigrants hail from nations other than Mexico, with an increase from sub-saharan Africa, Asia, and central America since 2009. These new immigrants are Black, they are Asians, and they have not been the voices that hold the dominant narrative surrounding the issues that affect undocumented immigrants. In a recent report by Black Alliance for Just Immigration (BAJI) Black immigrants have some of the highest unemployment rates among all immigrant groups when categorized by race at 7.4 percent, with Latino at 5.4 percent, and Asians at 3.7 percent. In August 2016, eight Cambodian men were detained by Immigration and Customs Enforcement. Since then five have been deported, three are still detained and one has been released to his family. The Twin Cities is home to a significant number of Liberians. As of May 21, the Trump administration terminated the long-standing temporary protected status program for Liberia, as well as Guinea and Sierra Leone, leaving many West African residents without an option to renew visas. Over a dozen states in the U.S. allow undocumented immigrants to obtain a driver’s license. From 2012 to 2015, when the DFL had majority seats in the Minnesota Legislature, bills were proposed four years in a row to give driver’s licenses to undocumented immigrants. Ultimately, the bills never passed and nothing changed. Now, vulnerable communities have been put on the defense, fighting against new hurdles for undocumented immigrants to be issued driver’s license. When it comes to politics local organizer Nestor Gomez Jimenez believes that it’s all a game of power for politicians. “It’s local grassroots organizers and activists who are challenging the elected officials that brings the real change we need. There are very few politicians that deeply care about their constituents. When we challenge them because they don’t care, they begin to care,” he said. For Black immigrants who are undocumented in the Twin Cities, their communities have been victim to silenced deportations. “It’s been difficult because the narrative of undocumented immigrants has been catered towards spanish speaking folks and there aren’t much for Black immigrants. When the Muslim ban happened people went frantic looking for pamphlets and brochures with information translated into Somali because it wasn’t readily available” said Abraham. But for some the fight is taking too long. With the changing political climate for one that’s unforgiving and hostile to immigrants, Farah sought refuge in Canada. “I felt very uncertain about how my future would look if I had stayed. I knew in Trump’s America, there would be a slim chance of getting documentation so I had to leave,” he said. He has recently obtained legal status and carries a Canadian driver’s license in his back pocket. Creating policy and passing laws without the affected sitting at the table is an old problem and it would be nice if it were illegal. Here in Minnesota and around the world it happens as normally as breathing. Yes, you can educate people to care. We all need to be educated/informed all the time. When you look around the table and everyone looks and sounds like you something is off. Its not enough to just talk about it, you have to do something about it over and over and over again. Until its common and normal as breathing.